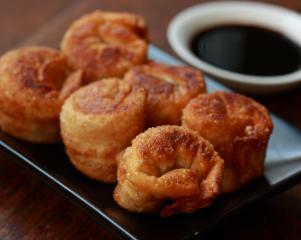 These fried dim sum can also be steamed or added to a broth although they are I think tastiest deep fried and served with sweet soy sauce. In a food processor blend the water chestnut, cabbage, carrot, soy sauce, sesame oil and white pepper until the mixture is a fine mince. Drain off any excess liquid and set aside the mixture in a bowl. Fill a small bowl of water for wetting your fingers. Take a wonton wrapper and place a teaspoon of mixture in the centre. Trace the border of the wonton wrapper with a wet finger. Halve the wonton into a rectangle being careful to push out the air from the mixture. Fold the flap back over the the pocket of mixture and seal with more water. Pull the two edges around the mixture and seal down. You will be left with a small cubic dim sum. Place on a damp tea towel (it will stick to a plate). Repeat with the remaining wontons. Heat an inch of oil over a medium heat until a small piece of wonton wrapper starts bubbling rapidly when dropped in the oil. Fry the wontons carefully in the oil until golden brown. Drain on absorbant paper and serve with sweet soy.